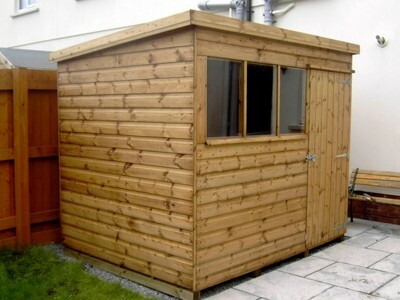 All our Standard range of Sheds are constructed to a high quality using 2”x 1½” planed framing, clad in 12 mm Tongue & groove shiplap, features 12 mm Tongue & groove roof & 12 mm Tongue & groove floor boards. 2 fixed windows with Profiled window sills are standard and all fittings are galvanised. Wall Sections are screwed together. Standard Pent Height: Back height- 6`. With a pent roof it offers flexibility as the door can be placed on any of the four walls to suit your own needs.